House cleaning after a move is often times a very difficult task. Whether you have been renting a home and want to get your cleaning deposit back or you are a landlord cleaning up after the previous tenant, the goal is to get the house cleaning completed as fast as possible. Real Property Management has discovered the best cleaning tips to get the job done right! 1. Shower-door soap scum and hard water stains: Spray with undiluted vinegar and wipe clean. For daily house cleaning, wiping with a used dryer sheet will keep it clean. 2. Hard-water deposits in your toilet bowl: Pour 1 cup white vinegar into the bowl and allow it to sit for several hours or overnight before scrubbing. A fizzy denture tablet works well too. 3. Mildew: Scrub the affected area with an old, damp toothbrush sprinkled with baking soda. 4. Showerhead: Unscrew the showerhead and submerge in white vinegar overnight, and the clogs will disappear. It you can’t unscrew it, fill a small, plastic bag with vinegar and attach to the showerhead with duct tape, or use an old toothbrush and vinegar. 5. Rust ring: The ring left behind by a can of shaving cream can be extremely difficult to remove and depending on the severity of the stain, you may need to try a few different options. Try scrubbing the stain with a pumice stone but make sure to keep the surface wet to avoid scratching the surface. CLR works wonders at removing rust, calcium and lime build up. Another solution that is a bit more natural is salt and lemon. Sprinkle salt on the stain then add lemon juice to soak the salt leaving overnight. 6. Stovetop grease stains: Wet the stains with vinegar and cover with baking soda. After watching the fun, foaming reaction, wipe with a damp sponge and buff with a dry, clean cloth. 7. Garbage disposal: About once a month, grind about a dozen ice cubes in your garbage disposal. The ice sharpens the blades and congeals any grease in the drain, allowing the disposal to break it up. Easily deodorize your disposal by throwing rinds to citrus fruit like lemons and oranges inside and grinding them up. 8. Oven: Place an oven-safe pot or bowl filled with water inside. Heat on 450º for 20 minutes, and steam will loosen the dirt and grease. Once your oven is cool, wipe off the condensation and the grease will come with it. 9. Dishwasher: Run it through an empty wash cycle using powdered lemonade mix instead of detergent. The citric acid in the mix will eliminate your problem and make it smell great! 10. Ceiling fan: Spray glass cleaner or a mixture of half vinegar and half water on the inside of a pillowcase. Put the pillowcase over one arm of the fan, and then pull it off while applying gentle pressure toward the floor. The pillowcase will wipe the top of the blade clean and catch any falling dust. 11. Gum in carpet: Apply a heat rub, like Bengay on the gum, then apply heat with your hair dryer set on low. Press a plastic sandwich bag on the gum and it should pull away easily. Make sure to wash the area after you’ve removed the gum. If the thought of heat and plastic on your carpet scares you, try holding ice on the area. It hardens the gum and can be lifted out of the carpet easily. Another solution is to run an iron over the gum with paper towels between the gum and the iron. 12. Crayon marks on walls: Remove it with a bit of WD-40 spray. Afterward, to remove the grease use a mixture of dishwashing detergent and white vinegar. 13. Fingerprints on walls or wallpaper: Rub the area with a slice of soft white bread. Then spray some starch on the area to keep fingerprints from showing up again. 14. Stains on wood floor: Leave mayonnaise on the stain for an hour, then wipe it off. 15. Pet, cooking, or other smells: Add a cotton ball soaked in vanilla to your vacuum cleaner bag, and vacuum away. Although it may be a huge undertaking, cleaning your home from top to bottom doesn’t have to be hours of scrubbing on your hands and knees. Moving is stressful enough and while cleaning the home is a necessary part of the process, we are here to help. From showing your home, screening prospects and leasing, to the entire move out process including cleaning, the professionals at Real Property Management Baton Rouge are always here to assist with every part of the process. 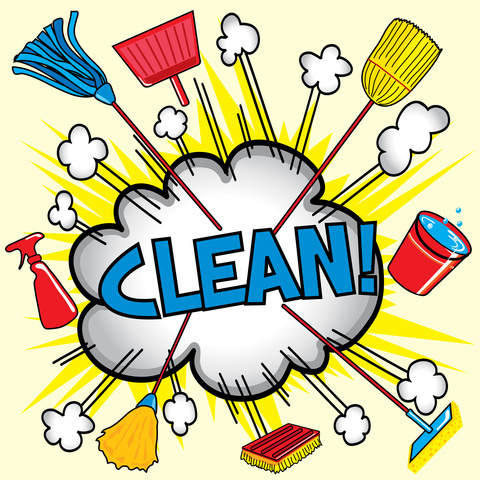 What are some great time saving and amazing house cleaning tips you have used? Do you have some other great uses for vinegar, lemon, or other household items? This will be really helpful for when I need to get the gum out of my carpet! Thanks Real Property Management for the tips!